horizontal shear lines near the floor. (2) Klemp,J.B., Dynamics of Tornadic Thunderstorms, Annual Review of Fluid Mechanics 19, (1987), pp.369-402. (3) Kusunoki,K., et al., An Overview of the Shonai Area Railroad Weather Project and Early Outcomes, Preprints, Fifth Conference on Radar Meteorology and Hydrology, Helsinki, (2008), P12.1. (4) Church,C.R., Snow,J.T. 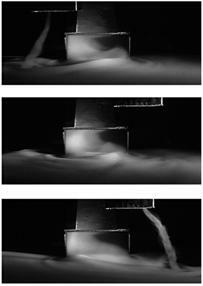 and Agee,E.M., Tornado Vortex Simulation at Purdue University, Bulletin of American Meteorological Society, 58, (1977), pp.900-907. (5) 文字信貴，光田寧，竜巻渦など小規模渦中に発生する副次渦の実験，京都大学防災科学研究所年報 28, B-1, (1985), pp.427-436. (6) Rotunno, R., A Note on the Stability of a Cylindrical Vortex Sheet, Journal of Fluid Mechanics, 87, (1978), pp.761-771. (7) Haan,F.L., Sarkar,P.P. and Gallus,W.A., Design, construction and performance of a large tornado simulator for wind engineering applications, Engineering Structures, 30, (2008) pp.1146-1159. 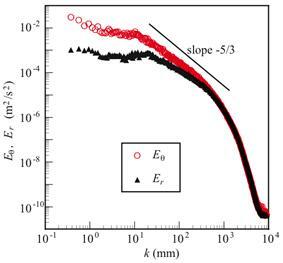 (8) Noda,A.T.and Niino,H., Genesis and Structure of a Major Tornado in a Numerically-Simulated Supercell Storm: Importance of Vertical Vorticity in a Gust Front, SOLA, 1, (2005), pp.5-8. (9) Mashiko,W., Niino,H. and Kato,T., Numerical Simulation of Tornadogenesis in an Outer-Rainband Minisupercell of Typhoon Shanshan on 17 September 2006, Monthly Weather Review 137, (2009), pp. 4238-4260. (10) Wakimoto,R.M. and Wilson,J.W., Non-supercell Tornadoes, Monthly Weather Review, 117, (1989), pp.1113-1140. 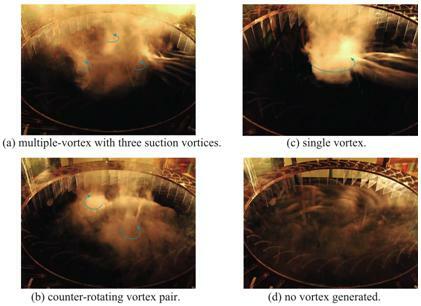 (11) Wurman,J., The Multiple-Vortex Structure of a Tornado, Weather and Forcasting, 17, (2002), pp.473-505. (12) Bluestein,H.B., et al., Close-Range Observations of Tornadoes in Supercells Made with a Dual-Polarization, X-Band, Mobile Doppler Radar, Monthely Weather Review, 135, (2007), pp.1522-1543. (13) Wakimoto,R. and Cai,H., Analysis of a Nontornadic Storm during VORTEX 95, Monthly Weather Review, 128, (2000), pp.565-592.